This is from work, the pings to West are around 30ms and consistent, makes sense because I am on the west side of the USA and should have a clean shot over to Salt Lake then over to LA or Silicon Valley. 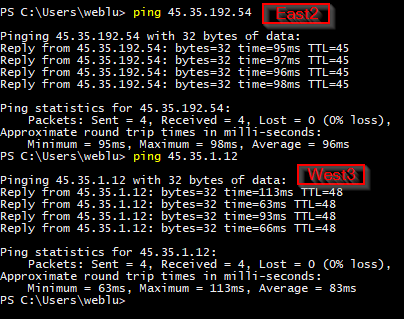 On the East server looks like around 65ms about right for double the distance or more and though a lot more networks, it isn't as consistent but close to the same. Now this is my cable internet at home mid day. West 63-113ms all over the place and higher, this I know gets routed all over the North West (Montana, Idaho) before it goes over to California. On the East it's about 97ms and a little more consistent but much higher as traffic goes up to Chicago and down to the East coast. 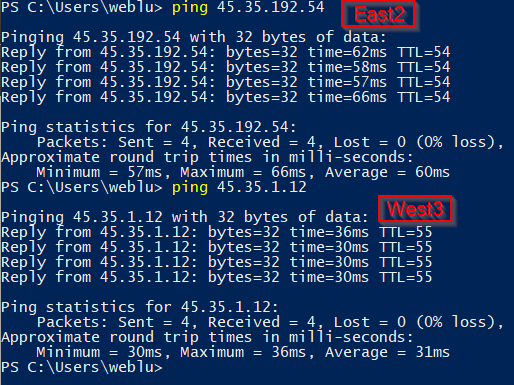 Just shows how much difference your ISP makes on your pings, unfortunately most of us are stuck with crappy cable companies that have no motivation to fix their crap networks, or make better routing deals. Any server host will have great connections with multiple ISP's in or be back bone providers (Google, AWS, MS) so it's not the servers that are the problem just cable monopolies who have 90%+ of the markets.